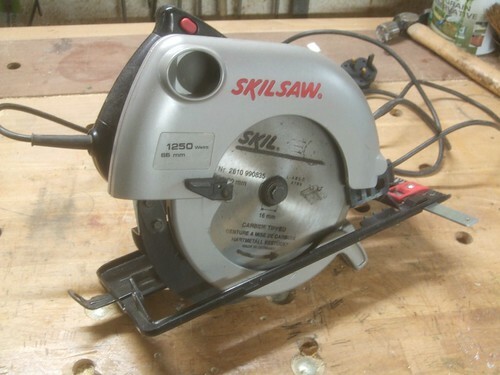 This one’s a bit of a classic, in the sense that the term ‘skil saw‘ derives from a portable powered hand tool very similar to the one I’ve purchased. My new toy was apparently made in 1997, in the USA as well, which may please many readers! Bosch have more control over the Skil brand these days and I wouldn’t be surprised if they were now manufactured in the Far East. I do own a rather large and cumbersome Hitachi C9U2, with a 9in blade and depth of cut capacity up to slightly more than 3in (80mm). It’s great for ripping through thick sections of timber that are too much for me to man-handle safely through the bandsaw (I bought it for my workbench build in 2009). For cutting sheet materials and anything no more than 1in thick though, it’s a bit much. Loud, powerful and unnecessarily heavy. 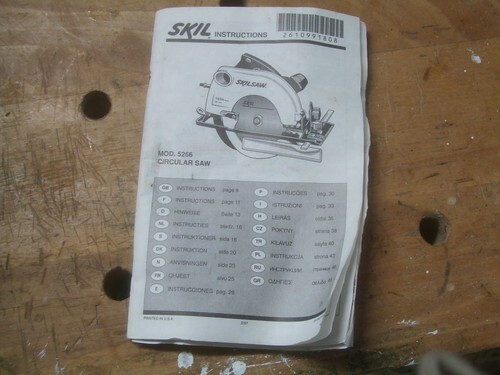 That’s why I bought this Skil model with its 190mm blade. 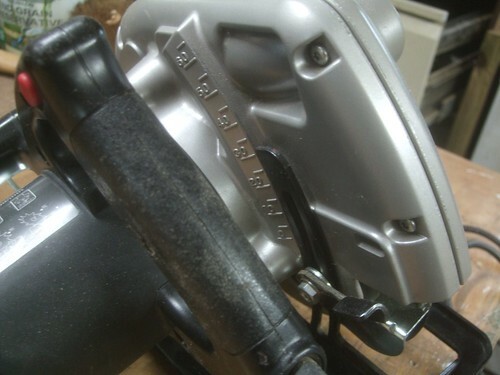 Like the Makita 5704RK I sold in 2009, it will still cut up to 66mm thick (I only sold that one to make way for the big Hitachi plus, it was a 110v tool… I thought I could do it all comfortably with one saw…). It’s got all the usual features you would expect from a circular saw of this size and class. I was pleased that the side fence was included – sometimes, these things can go missing, when you’re purchasing a used item. It seems to be in good nick all round and the motor sounds fine. I might be tempted, at some point, to drill a couple of holes in the face of the fence guide so that I can attach a longer strip of wood for extra support but, I reckon I’ll mostly be using this with a ‘shop-made guide (for sheet goods) or freehand (to remove the bark on waney-edged, sawn timber). While I mention the possibilities of cutting freehand without any kind of guide, this saw does have a useful little ‘sight’ at the front. On some cheap saws today, you’ll have a notch for 90° and 45° cuts but, it won’t be adjustable. This one can be adjusted to compensate for the fact that any blades I purchase may be of a different thickness with a different kerf. 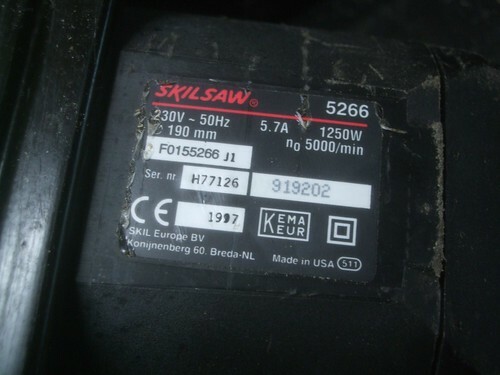 Speaking of which, this saw came with the original ripping blade that has only 12t – but then, its diameter is only 7¼in! I’ll be looking to add a 40t blade to my collection for crosscuts in solid boards and clean cuts in sheet materials. This saw has a smaller arbour than some others today, meaning I’ll have to look for a blade with a 16mm bore (or, I could purchase some bore reducers and still buy a 30mm blade, as they can be slightly cheaper, depending on where you look). One feature this saw doesn’t have is a spindle lock, to keep the blade still while you tighten or try to loosen the securing screw and flange. 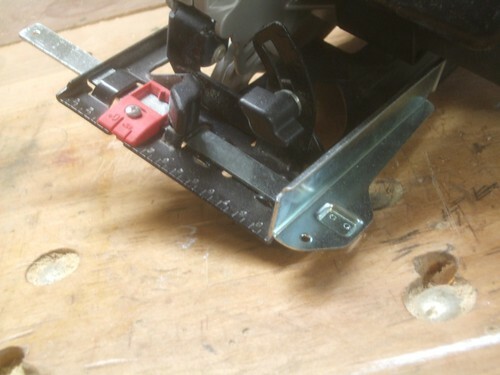 This is almost standard now on most saws that I’ve used and also own (sliding mitre saw is another). You could try and wedge a block of wood in there somewhere but, the recommended method is to use a pair of spanners. One is stored inside the base of the tool, at its rear end. However, the other one is missing… I’ll try asking the seller but, I suspect I’ll end up having to buy a flat 24mm spanner just for this. 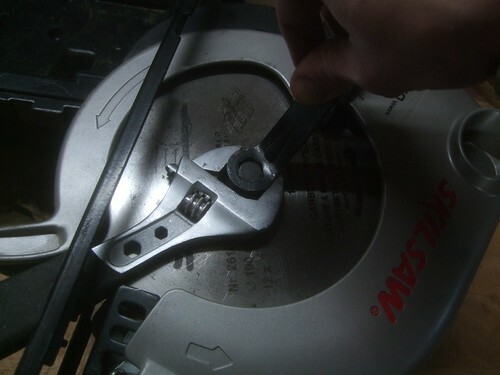 It’s not too clear in the photo above but, getting in there with an ordinary adjustable spanner isn’t easy. It is do-able but, you really need something thinner. Speaking of spares, a quick look at a parts diagram on Miles Tools’ website tells you that one spanner is still available to buy (the one I have) but not the other. Also worthy of note is that the carbon brushes are not available although, I’m sure I could find something suitable somewhere, if it came to it. 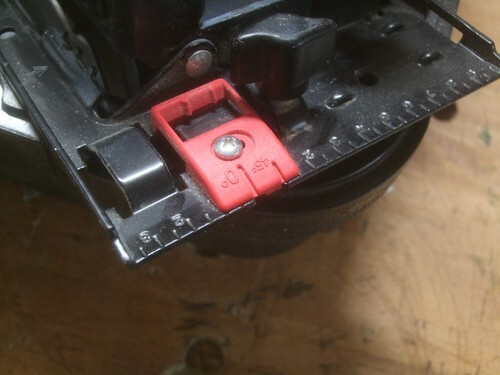 Something my Makita saw didn’t have was a depth scale like the one above, which basically tells you how far the blade is protruding below the base of the saw; meaning you don’t have to crouch down awkwardly to try and see where you are whilst struggling to keen the tool balanced. Unless you’re making very precise cuts for rebating or something, I guess. That scale on the fence is quite handy too and almost matches up perfectly with the markings on my tape measure. Well done for selling something to fund a purchase – I need to follow your lead. I’ve still got a freezer, hob and extractor fan taking up space in my garage and awaiting being listed on ebay.